Pune (Maharashtra), May 25 (IANS) A team of nearly 800 artists of Deluxe India here toiled for months to convert from 2D to breathtaking 3D effects the latest Hollywood magnum opus “Avengers: Infinity War”, thrilling audiences globally, an official said here on Friday. The film, which has crossed the $500 million mark at the US box office and $1 billion globally, has also become India’s highest grossing Hollywood release ringing in over Rs 2 billion, besides China, since its worldwide release in the third week of April. “As the lead 3D team, we completed the stereo conversion of this 110-minute film in approximately five months. We worked in concert with Deluxe’s stereo D teams in Burbank, California and Toronto, Canada which was an added advantage in creating a timely finish for this memorable project,” Gupta said. They explained that the stereo conversion process involved three major steps – Rotoscopy, Depth and Paint – which successfully creates the overall 3D effect while maintaining the natural shape of characters without distorting their original look in the film. Facing a tough, demanding production schedule, the teams worked hard together, led by Marvel Cinematic Universe (MCU)’s senior 3D team headed by Evan Jacobs and John Goldsmith. “The artists are the frontline, the ones who initiate the process of conversion from 2D to 3D, with assistance from supervisors, leads and production coordinators. The work of each team contributes to the 3D imagery on over 150,000 frames of the film’s footage,” Gade said. This calls for extraordinary team work with thousands of artists sitting on opposite ends of the earth coordinating with each other on a single project, having daily online sessions, receiving live feeds to review the work with the client and stereographers as per the client’s specifications, he added. In the present case, the client’s brief was “for a specific look and feel beyond simply cinematic, they wanted the superheroes to be overstated, and look natural but really powerful,” Gupta explained. “Deluxe India is equipped with state-of-the-art technology and we have worked on some of the best Hollywood films like “Rogue One: A Star Wars Story”, “Blade Runner 2049”, “Black Panther”, and “Avengers: Infinity War”, among many others,” said Gade. 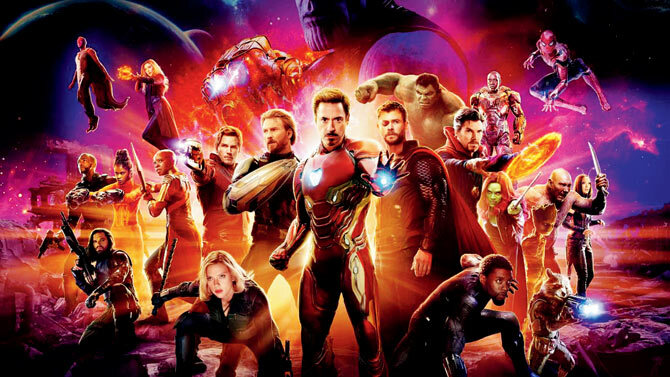 The latest release, “Avengers: Infinity War”, reunites a battalion of Marvel’s superheroes including Iron Man, Doctor Strange, Black Widow, Captain America, Thor, Black Panther, Hulk and Spider-Man, who come together to save the universe from the powerful Thanos. Incidentally, since 2008, the Marvel’s franchise has released 19 films including: “Iron Man” and “The Incredible Hulk” (2008), “Iron Man 2” (2010), “Thor and Captain America: The First Avenger” (2011), “The Avengers” (2012), “Iron Man 3” and “Thor: The Dark World” (2013), “Captain America: The Winter Soldier” and “Guardians of the Galaxy” (2014), “Avengers: Age of Ultron” and “Ant-Man” (2015), “Captain America: Civil War” and “Doctor Strange” (2016), “Guardians of the Galaxy Vol. 2”, “Spider-Man: Homecoming”, and “Thor: Ragnarok” (2017), “Black Panther” and finally “Avengers: Infinity War” (2018).